Confrontation's offering is dominated by the 'Wolven', a large range of 'dog-men' divided into two main camps: the Devourers of Vile-Tis and the Wolfen of Yllia. If you like them - and the elaborate style isn't to everyone's taste - then you'll find just about every fantasy weapon you can think of, along with many poses and garbs. However, there are more traditional (i.e. 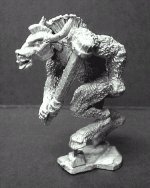 not werewolf) beastmen available. The 'Kelts of Drune' contain two explicitly named minoaturs and several minotaur like creatures, while there is a stayr and several twisted monsters which incorporated beastlike elements. Most figures are easily over 35mm in height, so may only fit into older armies as character figures. A line and game of goth-fetish creatures, after artist Brom's paintings. The Brood faction has a female Gazelle, that perhaps should be classified as borderline demon, instead of Beastman. 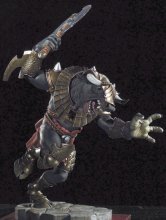 Wizards of the Coast's Chainmail line produced a minotaur, beautifull Gnolls and several wacky D&D monsters that could fit well into nya Wild Hunt. Unfortunately they're now out of production(i.e. dumped by Hasbro Corp.) and replaced by pre-painted plastics. Don't despair though, as they're still available on the net (mainly auction sites). 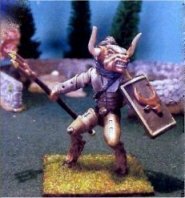 Strangely, old-timer Rafm doesn't seem to produce any beastmen, although not all ranges are available at the time of writing. 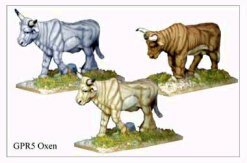 They do have a couple of very nice minotaurs by Bob Murch though. 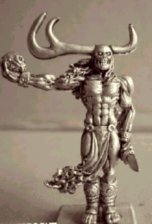 That famous lead necromancer, Amazon Miniatures, now has the old Global Games Rurope minotaurs. A range of Roman-ish minotaur legionairies of better quality than some products hiding in the Amazon catalogue. Foundry produce two minotaurs, one in Greek myths range and the other, somewhat strangely, in their Gladiator range (to the left). It is supposed to be a man dressed up? Is it supposed to be a minotaur? Either way, it looks fine. A new games company with a small miniature line called Blackmoor. The pictures are not too clear but look promising. Goatmen and an ape. More beastmen are promised for future release. Obscure Spanish company with beautiful mini's. This corrupted Cernunnos could lead your beast horde, but you'll have to import one directly from Spain. 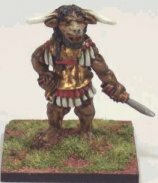 1st.Corps has an interesting savage Greek Minotaur, dressed in ancient garb. The quality isn't up to Rackham standards, but he'd (or she'd) fit into units made from most older figures. 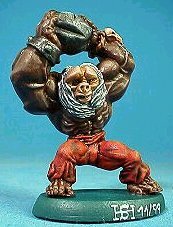 Warcrow are a relatively new Spanish manufacturer with a growing range of one-off fantasy characters, including Beastmen. These are supposed to be bigger than 30mm, more like Rackham's scale. 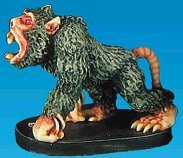 This much overlooked company produces some miniatures for Hackmaster, a roleplay game with what seems to be a fixation on simians (and why not!). Included in the range is a greater Satyr by Bob Olley. 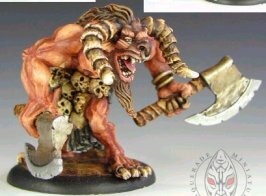 How great or tall this mini is I don't know, but it could be usefull as a leader of other beastmen (Like the Ral Partha ones from the same sculptor). It's a model which sometimes looks cartoony, other times more realistic, a difficult one to judge from the net. Newwave's own range has a 'limited edition' barebreasted Beastwoman, who is either in great pain or ecstacy and doing something with fire! She's certainly one of the best shamans available, but tricky to obtain. Excalibur has one goatman, an ape-mutation and a couple of werewolves. None are pornographic, unlike some of their other figures. Producing Mammoth Miniatures, Iron Mammoth (not to be confused with Urban Mammoth) is a small company producing mainly resin pieces. They also produce a small range of 28mm. 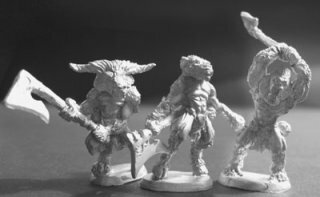 miniatures, including one goatman shaman. The picture is very unclear unfortunately, but the miniature could be quite nice. So, you've collected and painted the finest beastman army known to man (and beast) but you're still getting beaten on the field/table of battle. What do you do? 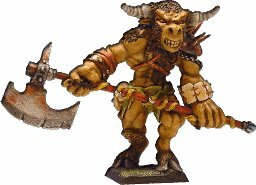 Get the Minotaurus from Pegaso, 20cm of Giant Minotaur sure to make your opponent swear loudly and sweat in fear. The beast is even modelled looking down at all the 30mm figures he's about to carve up. The 'Hobby Products' banner covers a number of ranges, including the 28mm Dark Eye line. What the models lack in sculpting they frequently make up for in verve and style, which is a polite way of saying they're often averagely sculpted but totally bonkers. The Demon Karmoth is a good example, a four armed, scythe wielding minotaur which could easily be fielded as a mutation among your herd. 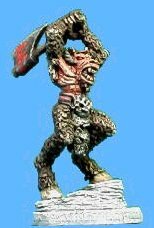 As well as a strange rat/tiger demon, Hobby Products also offer squirrel men (Difar Demons), monkey/rat men (Swamp Ranzas), a pretty poor werewolf and other oddities, but these are all on the borderline of being 'beastmen'. Alternative Armies has a small range of dogmen, for the Maelstrome game. Whether these are crude sculpts or badly painted is hard to tell thanks to a lack of images. 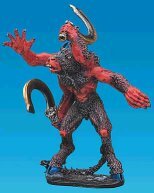 They definitely do have some nicely sculpted miniatures, like their Erin range (there, in the monsters & gods line is a horseheaded monster), but they also have some cloakers. 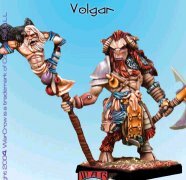 Australian manufacturer of generic fantasy including some beastmen. 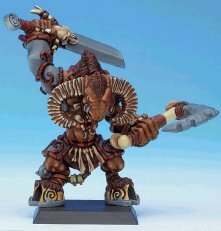 No idea what they look like or how to get them, but there's a listing on fellow-frother Chronofus' website. The vermin ratmen pictured there might give an idea. We all know what became of this company, and we all know they've got a big back catalogue of beastmen. What many people don't know is that they didn't invent them: it all started with some licensed miniatures for Runequest. Back in the early eighties, in the 'pre-slottabase era', they produced quite a few Broo; several boxed sets and blisters. 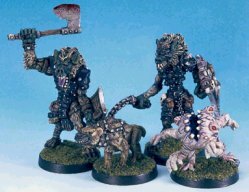 Games Workshop's chaos beastmen range evolved from these miniatures, as people were using them in their Warhamster armies, and some of the mini's where later sold as such when the license expired. Today, if you can find these long o.o.p. mini's at all, they usually sell for obscenely high prices, second-hand and with awfull paintjobs! Some of the above companies also have a choice of Werewolves, which can be as intended, or just as easily for dog-faced beastmen, like gnolls. Usually these are unarmed, so would need some conversion work with for instance Reaper's or Fenryll's weapon sets or brass rod. You could also use them effectively as alternative Hounds of Chaos. These companies have other creatures too that might be usefull for a mutant horde: bugbears, jack-o-bears, lionmen, centaurs, harpies, shapechangers, demons, apemen, birdmen, ottermen or other stange creatures with even stranger names. It's just a matter of running through their catalogues or online shop-sections to find that beastman you're looking for. - All images are copyright their respective companies and have been used here purely to promote them. Text copyright Area 23, 2005.